The AOA Foundation and The American Optometric Association (AOA), through generous support from Luxottica, award grants to optometrists and others that engage in community activities to address the U.S. Department of Health and Human Services Healthy People objectives and encourage a more comprehensive approach to the vision and health care needs of America's infants, children, adolescents, adults and seniors. 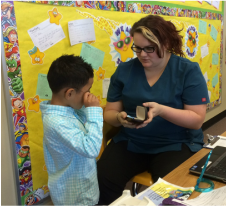 ﻿The project partners with the Putnam City Schools to help students and parents understand the critical difference between eye exams and vision screenings, and the importance of timely comprehensive eye exams for school-age children to reduce visual impairment. ﻿ ﻿This study is designed to educate the public on the risks and vision outcome of age-related macular degeneration (AMD); and to reinforce the importance of proper nutrition to prevent, slow, or possibly reverse the devastating vision loss caused by AMD.